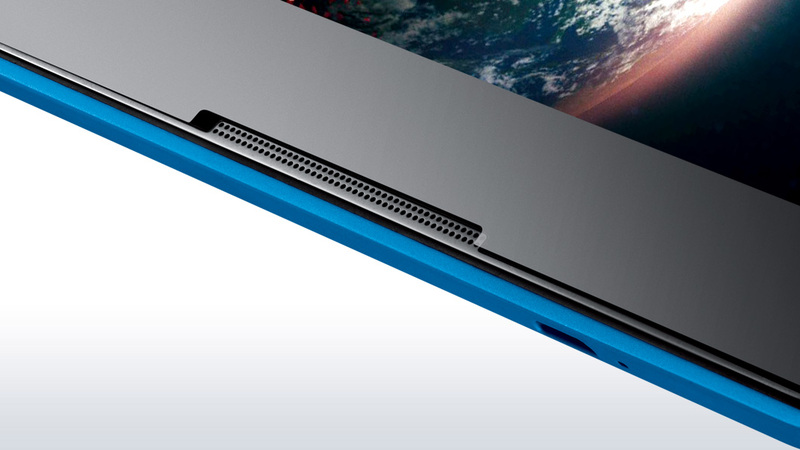 Lenovo's new Tab S product line is higher quality than the Tab A line. Our review sample, the Tab S8-50F (59426775), is the first device of the lineup and competes against established models like Samsung's Galaxy Tab S 8.4. Lenovo offers four different colors for the casing and, when desired, LTE support that our review sample does not feature. Lenovo's tablet faces the LG G Pad 8.0, Sony Xperia Z3 Tablet Compact, Apple iPad Mini 3, and Google Nexus 9 in our test. We also added the aforementioned Samsung Galaxy Tab S 8.4 to the comparison devices. Ever since Nokia clad its Lumia smartphones in colorful plastic, colors have become highly asked for among some customers. Lenovo answers this call with its Tab S8 and offers the customer a dark-gray, blue or yellow casing back cover. Regardless of the color, it has a rubber-coated surface that cannot be removed. 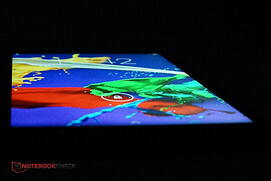 The display part is marginally smaller than the back, which creates non-slip but also partly sharp-edged sides. The silhouette of 7.9 millimeters is a bit thicker than most other comparison devices; only the equally priced LG's G Pad tablet is considerably thicker. Lenovo's Tab S8 is very light with 299 grams and only the Xperia Z3 Tablet Compact undercuts this weight. The rigidness is unsatisfactory. Pressure from the back is quickly seen on the screen, and the casing can be twisted to quite an extent. A cracking noise also becomes very audible. 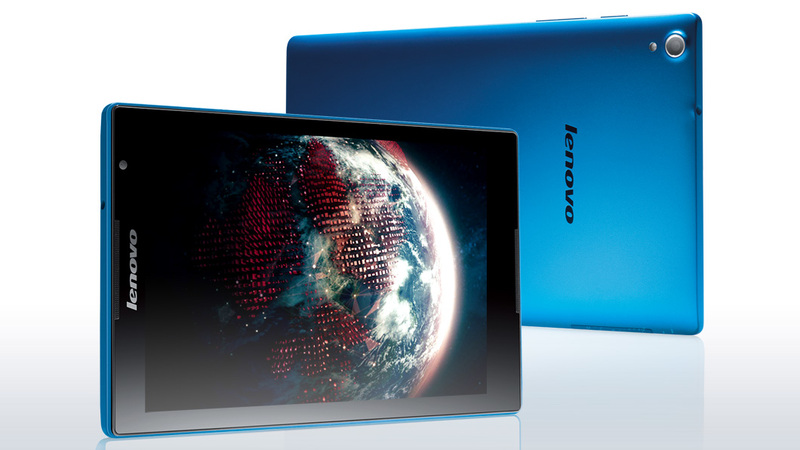 Like the equipment in most comparison models, Lenovo's Tab S8 sports 16 GB of flash memory. The storage can, however, be expanded with an SD card - an advantage over Apple's iPad Mini 3 or Google's Nexus 9. There are no special interfaces. Solely a micro-USB port, micro-SD reader, and the 3.5 mm combo-audio port are installed. 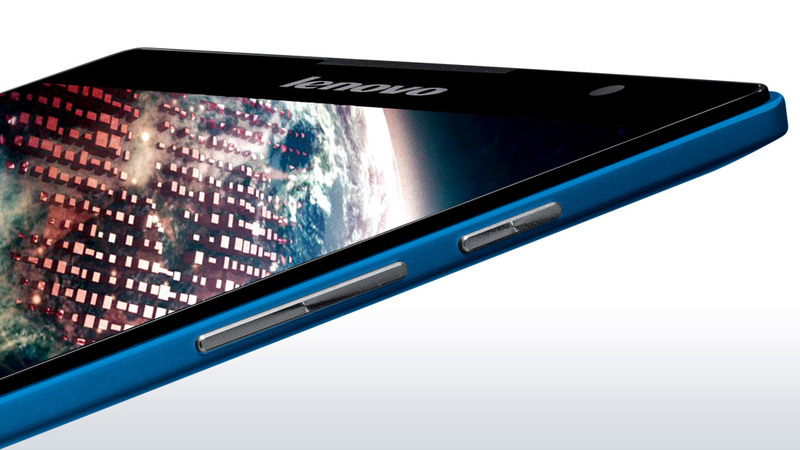 Lenovo uses a virtually unmodified version of Android 4.4.2 as the operating system. Slight changes have only been made in the option menu and in the forms of the widgets on the home screen. 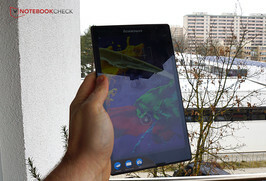 Lenovo implements a multimedia overview about the device so that the user can get to know the features of the new tablet. However, Lenovo preloads a few additional apps. For example, the Chinese manufacturer contributes the Security HD software that provides an app permission manager, an ad blocker, and which speeds up the device when necessary. SHAREit, SYNCit, and CLONEit are programs that allow sharing content, updating via the cloud or copying all data from an old smartphone or tablet. Navigation software is just as available as three browsers. The software bundle is extensive and some are even useful. However, there are also adware apps, and the user will likely have to uninstall some of the programs when not all are needed and thus regain storage capacity. The GPS module in Lenovo's Tab S8 also supports the Russian Glonass network. We could not establish a connection indoors in a quick test using the GPS Test app. It took quite some time to find enough satellites outdoors, and we were located with an accuracy of approximately ten meters then. The Wi-Fi module supports network standards up to 802.11 n and Bluetooth 4.0. Reception was rather middling. We only had half the signal strength at a distance of ten meters to the router and through three walls. Nevertheless, websites still opened quite fast. Two more meters and another wall resulted in only one-quarter of the signal strength, and pages opened noticeably slower. 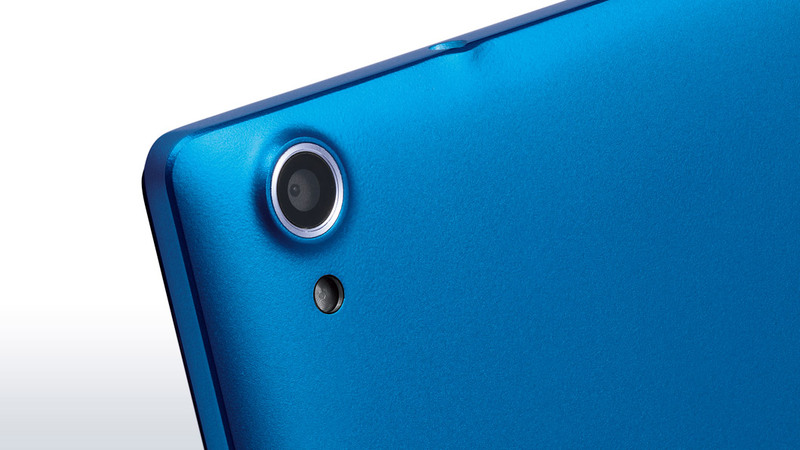 An 8-megapixel camera with auto-focus and LED flash is on the rear. It shoots decent pictures even in low-light conditions without the flash. The pictures are high-detail and can even be zoomed in bright surroundings. The front-facing camera has a lower resolution of 1.6 megapixels but still makes the best of the situation in good light conditions. It is sufficient for video calls or a quick selfie. The camera equipment is almost just as good as that of the considerably more expensive comparison devices. For example, the iPad Mini 3 has to be satisfied with only a 5-megapixel camera. Although there are no accessories included apart from the power supply, Lenovo has cleverly formed a part of the box like a tablet stand made of recycled cardboard that can be taken out. A good idea - it does not always have to be plastic. Only a 12-month warranty is included, but a 24-month retailer warranty is applicable in many EU countries. Every deep-seated Android user will recognize the virtual keyboard right away. It is the operating system's stock version. Its size on the 8-inch screen is big enough to work comfortably with it using both hands. Besides that, voice dictation and inputting via swipe are also available. Users, who nevertheless do not like the well-structured and clearly arranged keyboard, can find countless alternatives in Google's Play Store. The touchscreen functions very reliably up into the corners and also usually recognizes multi-touch gestures without problems. The right-hand hardware buttons for standby mode and volume are easy to find and have a decent pressure point and respond reliably. 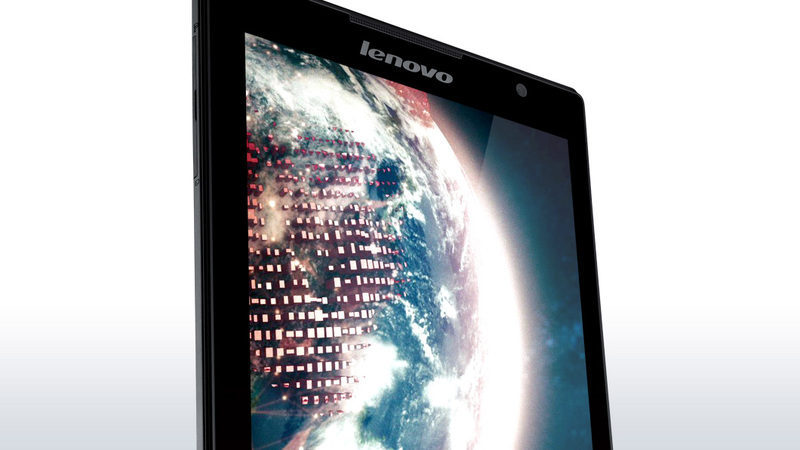 Lenovo's Tab S8 sports an IPS screen with a resolution of 1920x1200 pixels, which is slightly higher than Full HD. A higher resolution is only found in the considerably more expensive comparison devices. 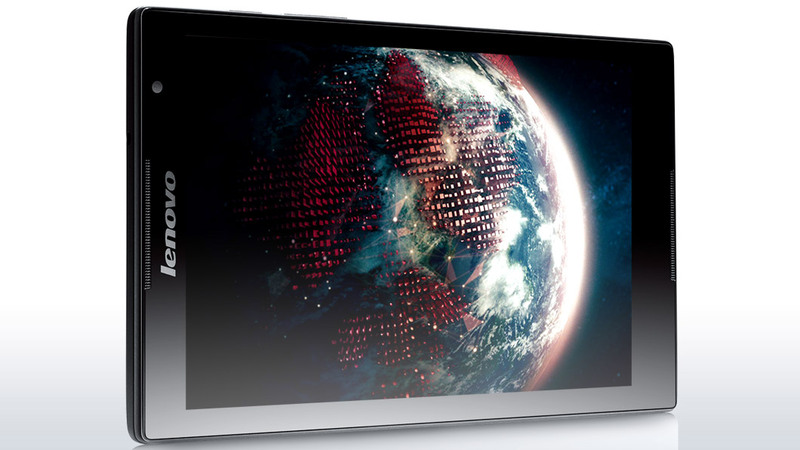 The equally priced LG G Pad 8.0 can only offer 1280x800 pixels. Full HD looks good on Lenovo's tablet; fonts and logos are sharp, pixelation is not evident even when holding the screen very close to the eyes. The maximum brightness of 418 cd/m² is rather midfield among the comparison devices but should easily be enough for routine use. The illumination of 85% is homogeneous. Lenovo's Tab S8 reaps in points in black level: 0.22 cd/m² is a great rate that is only surpassed by Samsung's Galaxy Tab S 8.4 with its AMOLED screen, owing to its absolute black. This results in an excellent contrast ratio of 1900:1 for our review sample. The color reproduction looks correspondingly rich on the screen. An examination using the spectrophotometer and CalMAN software provides details about color reproduction. We did not recognize a bluish cast. There was more a slight surplus of yellow color components. However, that was relatively low and did not falsify the colors much in comparison to the sRGB reference color space. Since this shift is evenly distributed over all colors, the screens in the comparison devices provide a more accurate color reproduction, though. 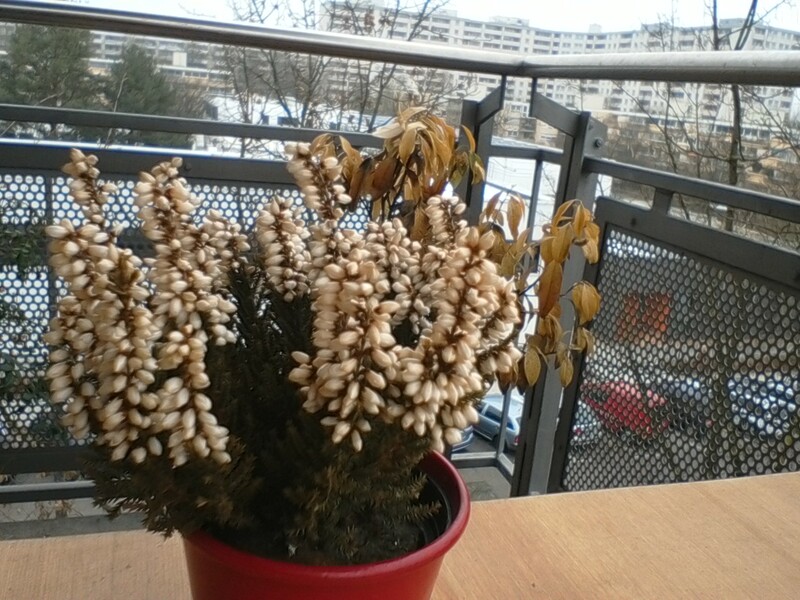 High contrast, decent brightness - those are the best preconditions for using Lenovo's Tab S8 outdoors. Although the glare-type screen prevents use in bright sunlight, it is still possible to see what's happening on the screen in bright surroundings. The IPS screen allows impeccable viewing angles in all directions. Intel's Atom Z3745 is a favorably used SoC with four cores and a clock rate of 1.33 - 1.86 GHz. The user is thus well-equipped for the majority of apps in the Android field. Although the processor slightly lags behind the considerably more expensive devices in Geekbench 3 (multi-core), it should be tolerable considering the price difference of up to 100%. The performance of the equally expensive LG G Pad is clearly surpassed. The Intel HD Graphics (Bay Trail) can even beat the graphics unit in Samsung's Galaxy Tab S 8.4 - an ARM Mali-T628 MP6, in many benchmarks. 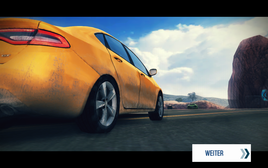 The graphics power should thus at least come close to that of the pricier comparison devices. 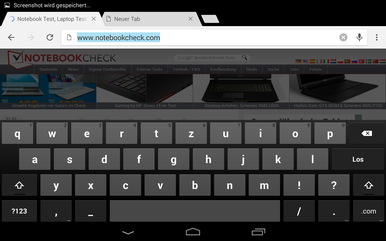 Lenovo's Tab S8 is sometimes even faster than its rivals when browsing via Chrome. 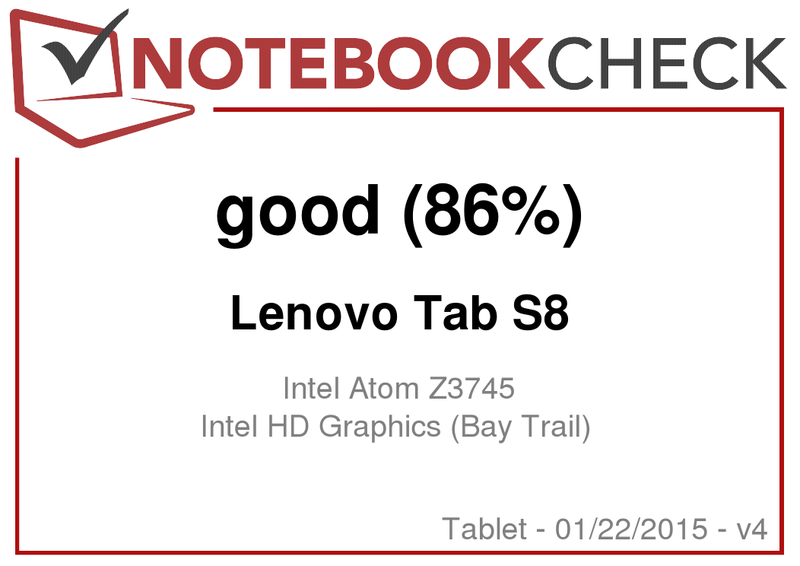 The Tab S8 cannot always keep up when accessing the flash storage, but it does an overall good job. The unmatched winner is Google's Nexus 9 with one of the fastest storage devices that we have ever tested in an Android device. 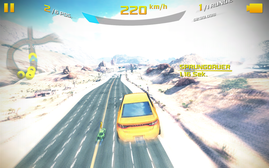 The graphics unit easily copes with graphically sophisticated games like Asphalt 8 even in high settings and without losses in frame rate. Controlling via position sensor and touchscreen are also beyond reproach. The graphics card does not have problems with high-requirement games. Everything runs smoothly even in highest settings. 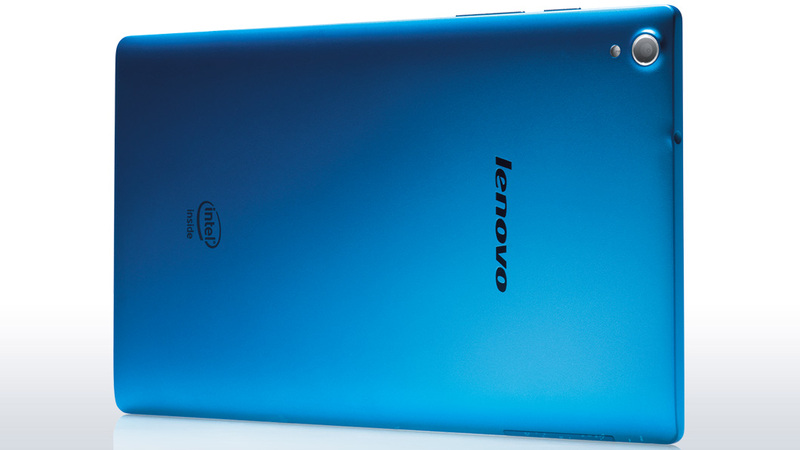 The part about temperatures is quickly closed in Lenovo's Tab S8. A temperature increase is actually not at all noticed in idle mode, and it remains very low with a maximum of 33.8 °C on the back even during load. 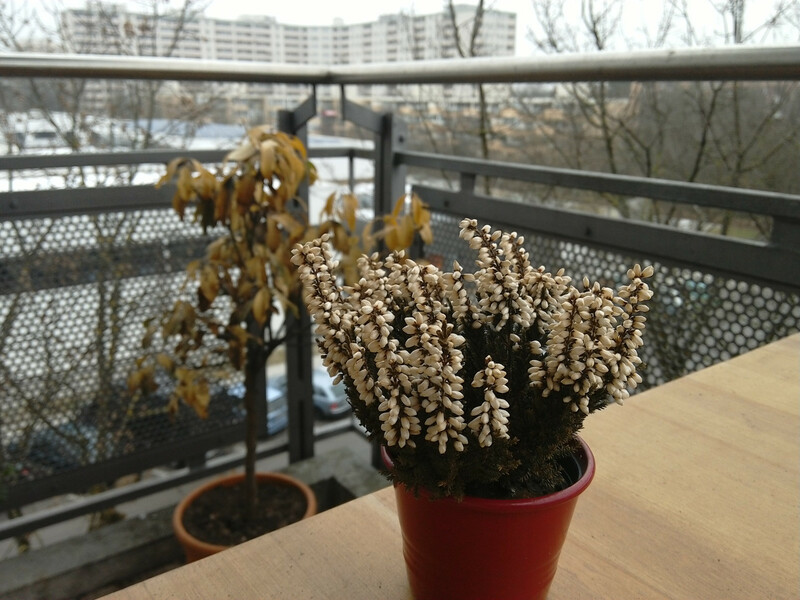 Although some waste heat is felt, it would not really be enough to warm the hands with it. (+) The average temperature for the upper side under maximal load is 28.5 °C / 83 F, compared to the average of 30.7 °C / 87 F for the devices in the class Tablet. (+) The maximum temperature on the upper side is 30.4 °C / 87 F, compared to the average of 34.8 °C / 95 F, ranging from 22.2 to 51.8 °C for the class Tablet. 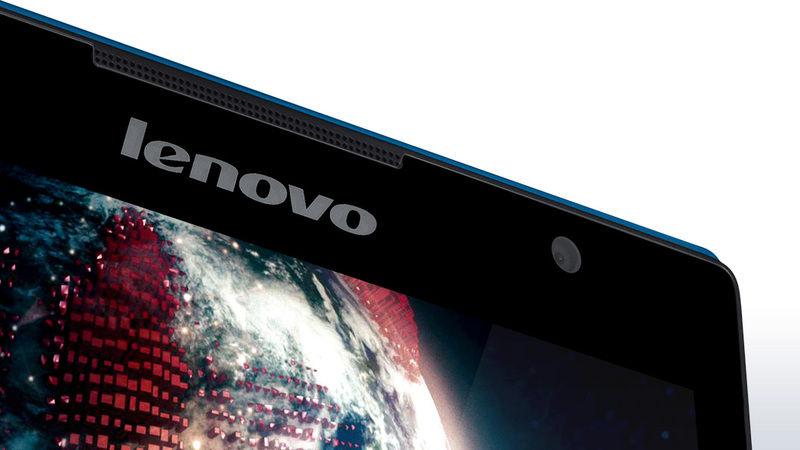 Two front-facing speakers with Dolby software support truly sound as if Lenovo's Tab S8 might just produce a decent sound. That is also the case, but with some restrictions. The maximum volume is good, but the speakers quickly sound overburdened. Bass is both palpable and audible, and a very clear weakness in the mids can be balanced well via the equalizer in the Dolby app. Thus, a very good sound is possible in total. The minimum idle consumption of Lenovo's Tab S8 is a relatively high 1.9 watts. Sony's Xperia Z3 Tablet Compact is happy with just 0.6, for example. The other idle rates do not provide any top values with 3.3 and 3.7 watts. Our review sample is also clearly undercut from the higher-performance Sony Xperia Z3 Tablet Compact during load. Otherwise, it is more frugal than its other rivals. 7.2 watts is the absolute maximum consumption. The battery has a much lower capacity than some more expensive devices: 16.3 watt hours is quite meager compared with the 25-watt hour battery in Google's Nexus 9. Nevertheless, Lenovo's Tab S8 manages longer battery runtimes than the Nexus 9 because it has a smaller screen than Google's tablet and also generally conserves its energy better. The overall winner in this comparison is Sony's Xperia Z3 Tablet Compact, which achieves a 28% longer battery runtime than our review sample. However, Lenovo's Tab S8 is definitely fit for use with over 10 hours of Wi-Fi browsing time. 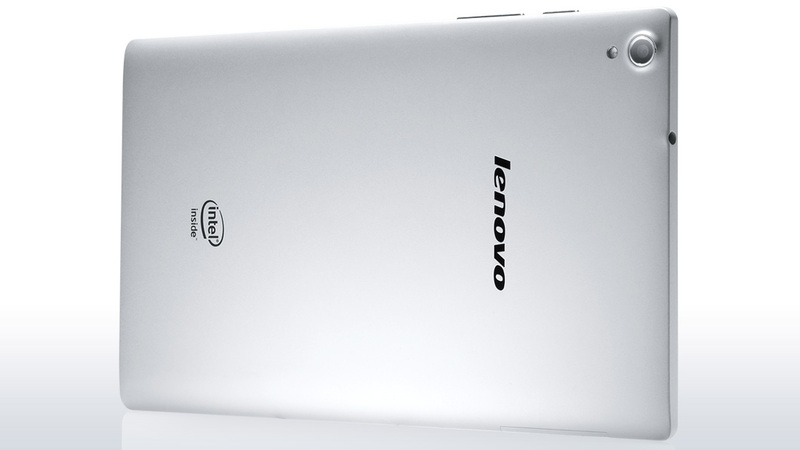 Buyers who do not need the prestige of an iPad Mini 3 or the coolness of a Nexus 9 will find Lenovo's offer attractive. The Tab S8 sports a sharp Full HD screen, decent camera equipment, relatively rich-sounding speakers, high performance, and feasible battery runtimes. It is, however, surprising that Lenovo's Tab S8 clearly outperforms the considerably more expensive models from Apple and Google in some categories. Lenovo's tablet has most definitely earned a performance-for-money title and a clear purchase recommendation. However, the buyer will have to tolerate the screen that does not make a particularly rigid impression and has a few sharp edges. 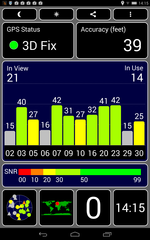 Also, the Wi-Fi and GPS reception is not very strong. Users who do not have a problem with that can take delight in a well-designed alternative to commonplace tablets. The low weight and quite classy looks. The performance-for-price ratio is also really good. The stability could be better; no-one really wants to hear their tablet creak and crackle. How well the low-priced tablet keeps pace with considerably more expensive contenders. LG G Pad 8.0, Sony Xperia Z3 Tablet Compact, Apple iPad Mini 3, Google Nexus 9, Samsung Galaxy Tab S 8.4.